On a micro scale: Annual institutional projects assigned to each researcher according to the priorities of CIB in a particular year. This funding permits limited scientific research, maintenance of the infrastructure, and provides office supplies and participation in scientific conferences. On a large scale: Competitive grants from agencies of the federal government of Mexico, from agencies abroad, and from industry. This funding supports research, purchasing of new equipment, and acquiring out-of-country services. The group does not provide any scientific services. 2018-2020 - "The National Science and Technology Council of Mexico" (CONACYT-Basic research program). 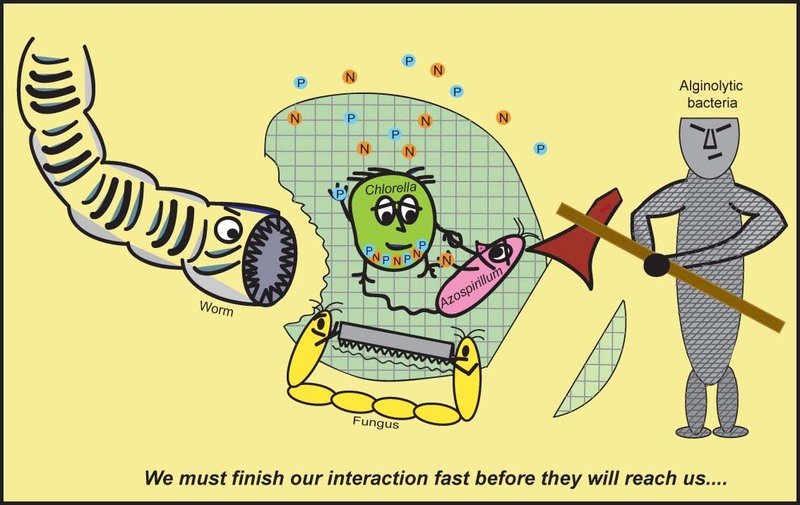 Project: Symbiotic association between microalga and Plant Growth-Promoting Bacteria: reciprocal effect of extracellular metabolites on metabolism and gene expression of each partner. Production of mesquite trasplants for reforestation of arid zone. 2016-2018 - "The National Science and Technology Council of Mexico" (CONACYT-Basic research program). Project: Establishment and functional optimization of natural and synthetic mutualisms. Production of mesquite trasplants for reforestation of arid zone. 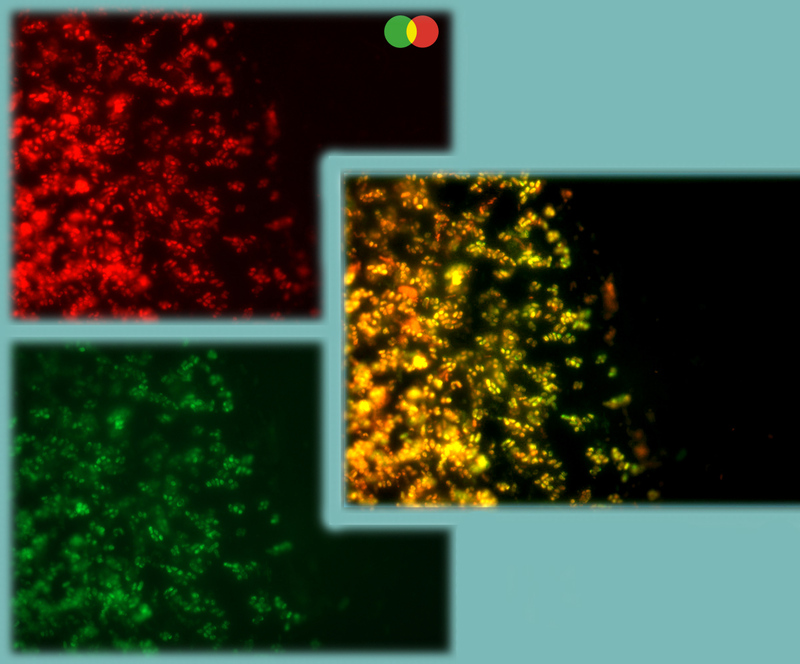 Epifluorescence microscopy (a, b) and confocal scanning laser microscopy (c) of the interaction between Chlorella vulgaris and Azospirillum brasilense after the alginate matrix was dissolved.Scale bars, 1 μm. 2014-2018 - Mexican agency for international cooperation for development, Ministry of Foreign affairs and, the Presidential Agency for international cooperation of Colombia. Project: improvement in the production of biofertilizers applied in agroindustrial crops in Colombia. Construction of probe of the plant growth-promoting bacteria Bacillus subtilis useful for fluorescent in situ hybridization. 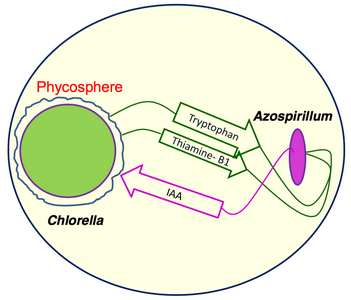 Particiapation of type VI secretion system in synthetic mutualism between Azospirillum brasilense and Chlorella sorokiniana. 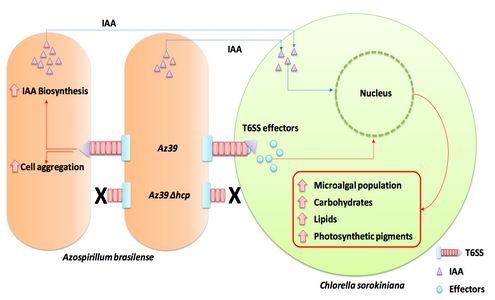 Mutualistic interaction between the microalgae Chlorella sorokiniana and the microalgae growth-promoting bacterium Azospirillum brasilense. 2014-2016 - "The National Science and Technology Council of Mexico" (CONACYT-Funds for innovations FINNOVA) Project: Pilot plant for validation of biotechnological platform of microencapsulation of bio-drugs against viral diseases in aquaculture. 2013-2015 - "UC-Mexus". Project: Searching for bacteria living in the rhizosphere of native desert plants in the Sonoran Desert that restore soil fertility to degraded land in Baja California. 2014-2016 - "The National Science and Technology Council of Mexico" (CONACYT-Basic research program) Project: Pilot plant for validation of biotechnological platform of microencapsulation of bio-drugs against viral diseases in aquaculture. 2014-2015 - "Laboratorio Farroupilha. Brazil" Project: Extending shelf life of bacterial inoculant. 2012-2014 - "The National Science and Technology Council of Mexico" (CONACYT-Basic research program) Project: Microalgae-Plant growth-Promoting Bacteria association: effect of the phycosphere and bacterial exudates on establishment and maintenance of the interaction when immobilized in alginate beads. 2011-2014 - "National Science and Technology Council of Mexico" (CONACyT). Project: Physiological and genetic mechanisms in the establishment and maintenance of mutualisms of plants with different partners. 2011- 2012 - "UC-Mexus". Project:Influence of biochar and compost in the phytoremediation of oil contaminated soil. 2008- 2009 - "National Science and Technology Council of Mexico" (CONACyT). Project: Study of the interactions and population dynamics between microalgae and microalgae growth-promoting bacteria in wastewater treatment using molecular tools. 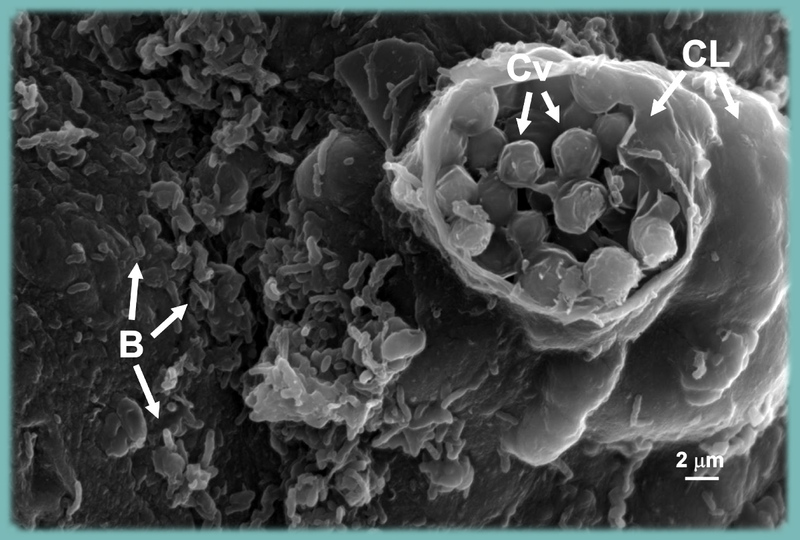 Surface of alginate bead containing the microalgae Chlorella vulgaris (Cv) and the native bacteria of wastewater (B) during wastewater treatment as shown by Scanning Electron Microscopy. (CL) surface of alginate. 2007- 2009 - "National Science and Technology Council of Mexico" (CONACyT). Project: Cellular mechanisms controlling the combined growth of microalgae and microalgae growth-promoting bacteria and their contribution to eliminate nutrients (N and P) from wastewater. 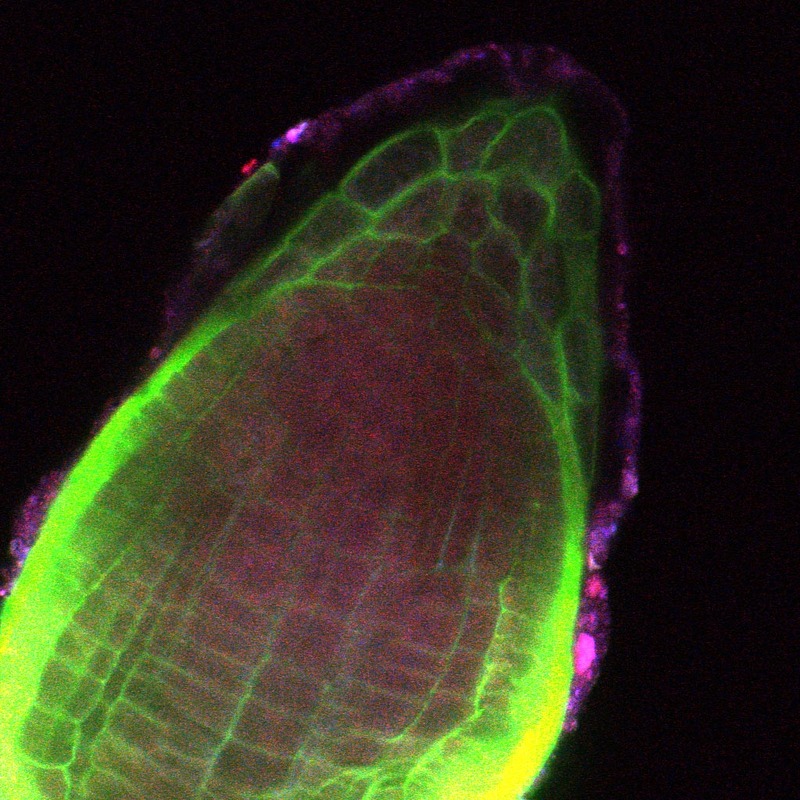 Root colonization of Sorghum plants by the Plant Growth-Promoting Bacteria Azospirillum brasilense visualizing by Scanning Confocal Laser Microscopy. Purple colors are the bacterial cells. 2007- 2009 - "Ministry of the Environment and Natural Resources of Mexico" (SEMARNAT). Project: Scaling up of a new technology for tertiary wastewater treatment combined with restoration of eroded arid soils using co-immobilized bacteria and microalgae. 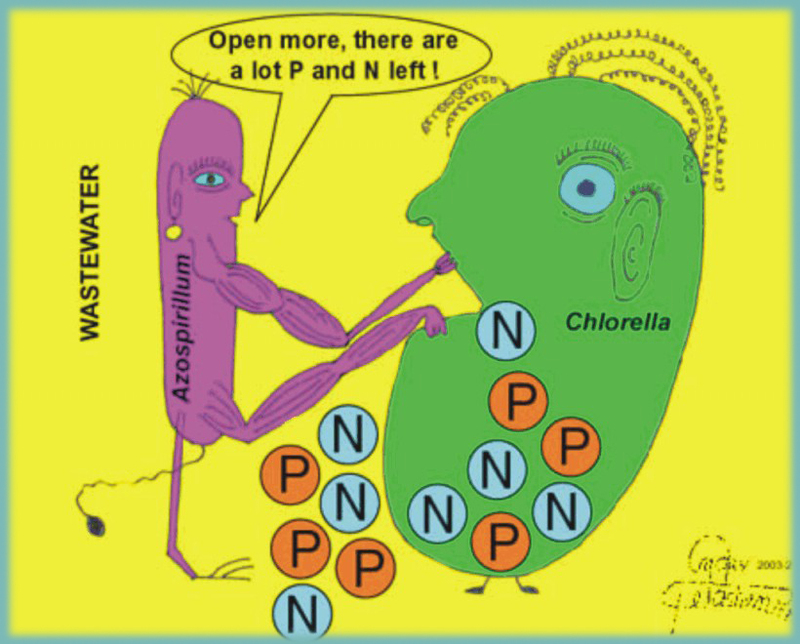 Joint immobilization of the microalgae Chlorella and the plant growth-promoting bacteria Azospirillum used as agents for wastewater treatment in polymer alginate beads provides them essentialprotection against predatory organisms residing in wastewater. (Created by Y. Bashan). 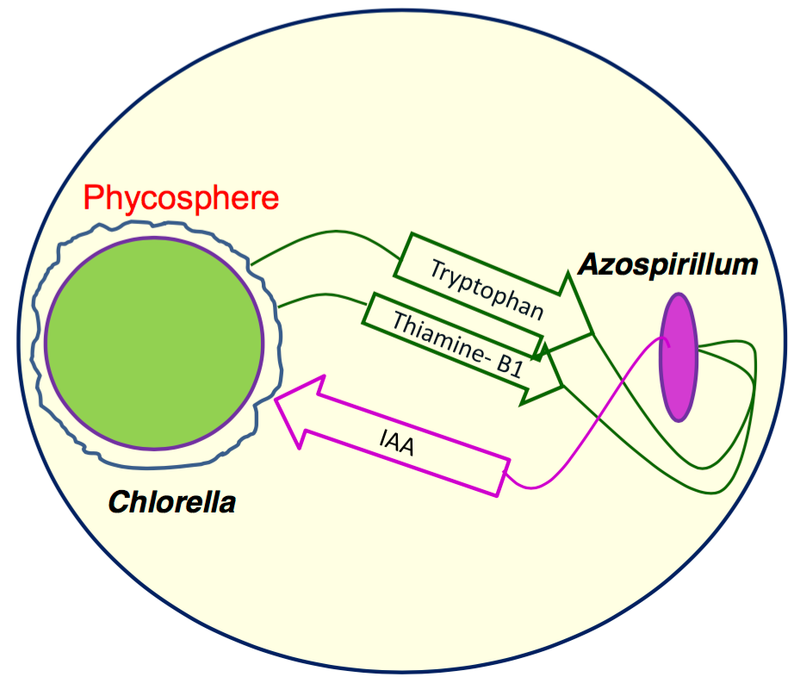 The possible effect of the microalgae growth-promoting bacterium (Azospirillum) on microalgae (Chlorella) used for wastewater treatment (Created by Y. Bashan). A conceptual model for co-immobilization of microalgae and bacteria in alginate spheres for wastewater treatment. Both microorganisms are randomly co-immobilized in the polymeric matrix. Nitrogen and phosphorus from the wastewater diffused inside the sphere and incorporated as cell components of the microalgae, increasing its population and releasing oxygen into the medium. 2006-2009 - "Ministry of Public Education " (SEP) and "National Science and Technology Council of Mexico" (CONACyT) Project: Phytostabilization of mine tailings in northwestern Mexico: The role of plant-soil-microbe interactions. 2004-2007 - "Ministry of Public Education " (SEP) and "National Science and Technology Council of Mexico" (CONACyT) Project: Mitigation of saline stress in chili pepper plants using compost and plant growth-promoting bacteria. 2003-2006 - "Ministry of Public Education" (SEP) and "National Science and Technology Council of Mexico" (CONACyT) Project: Desert reforestation: the role of soil and rock microorganisms, and resource islands on the establishment of plants for restoration of degraded desert areas. 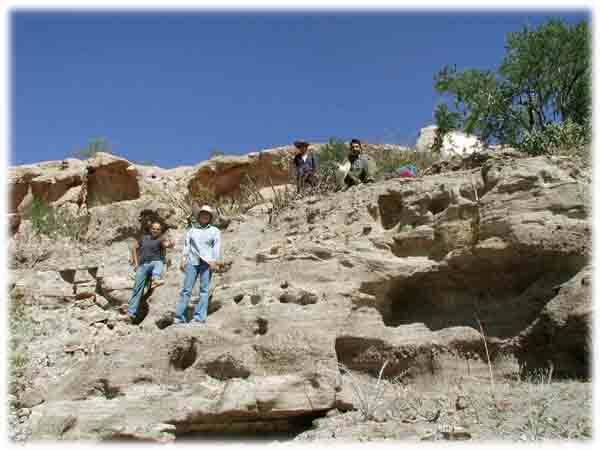 Field survey for rock degrading cacti and bacteria. 2003-2005 - "Ministry of the Environment and Natural Resources of Mexico" (SEMARNAT). Project: Design of new combined strategy for biological treatment of wastewater and restoration of eroded soils using microalgae growth-promoting bacteria (MGPB) and microalgae coinmovilized in polymers. 2001-2002 - "National Science and Technology Council of Mexico" (CONACyT). 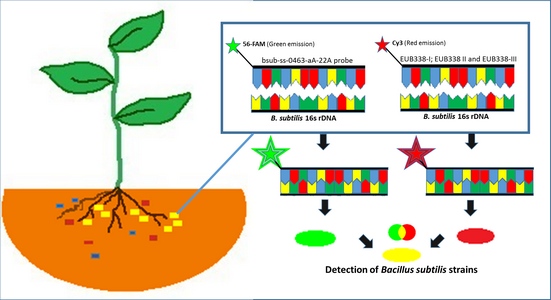 Project: Molecular transformations of the plant growth-promoting bacterium Azospirillum brasilense. (Cathedra for Dr. Hilda Rodriguez, Cuban Research Institute on Sugarcane By-Products, Habana, Cuba). 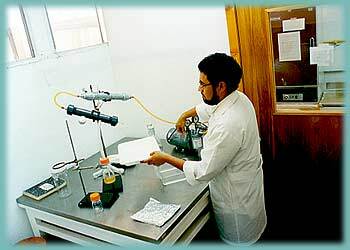 1999-2002 - "Laboratorios Agroenzymas Inc., Tlanepantla, Mexico". 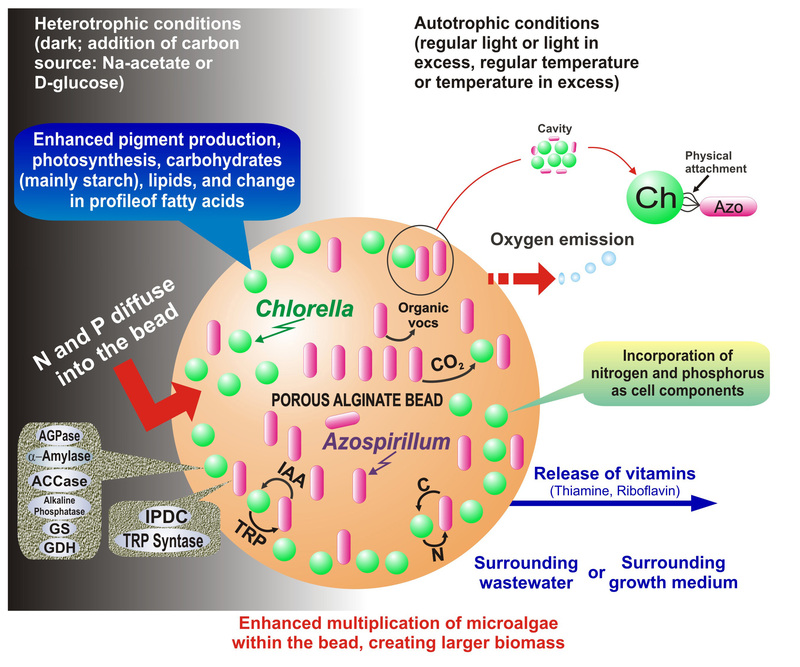 Project: Alginate microbeads as bacterial inoculant for added-value crops in Mexico. 1997-2000 - "National Science and Technology Council of Mexico" (CONACyT). Project: Electron Microscopy of plant-microorganism interactions. (Cathedra for Dr. Vladimir Lebsky, Russian Institute of Agricultural Microbiology, St. Petersburg, Russia). 1999-2000 - "National Science and Technology Council of Mexico" (CONACyT). 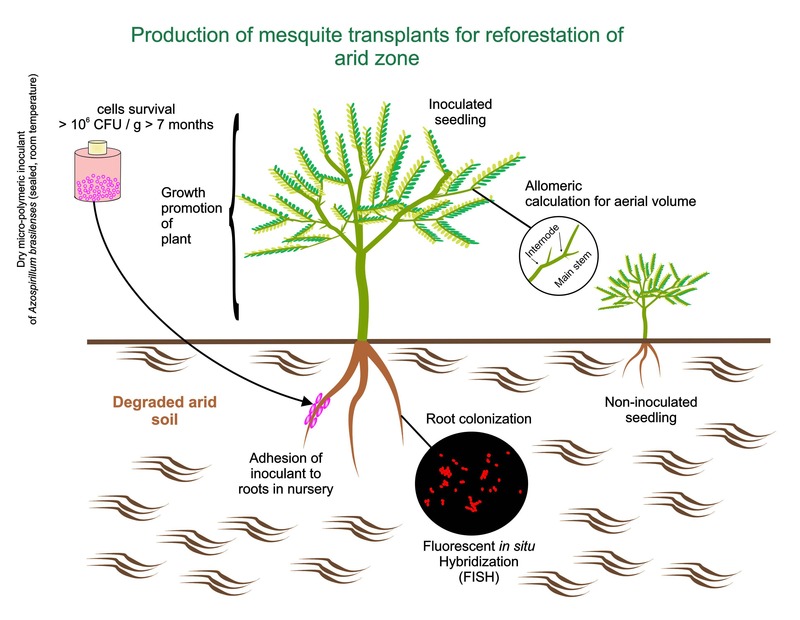 Project: Reforestation of eroded urban areas and abandoned agricultural fields to reduce dust pollution, using desert plants inoculated with plant growth-promoting bacteria. 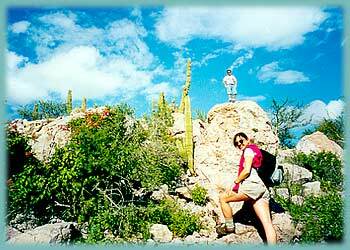 Luz Gonzalez de Bashan and Juan-Pablo Hernandez in a survey for flowers in the desert. 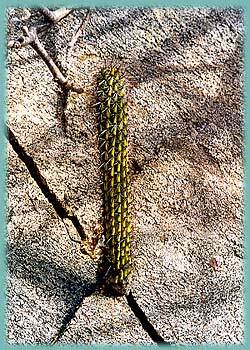 Pitaya dulce growing in solid rock. 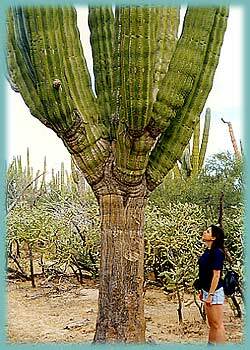 Luz Gonzalez de-Bashan is facing a giant cardon cactus, perhaps one of the biggest in the world. 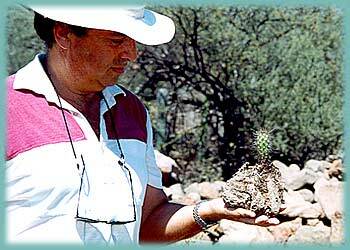 Yoav Bashan is holding the entire "world" of a small cactus growing in solid rock. 1998-2001 - "National Science and Technology Council of Mexico" (CONACyT). Project: Development of mixed bacterial inoculants for agriculture in semi-arid zones, desert reforestation and bio-treatment of residual water. Angel Carrillo prepares alginate bacterial microinoculants for inoculation of plants with plant growth-promoting bacteria. 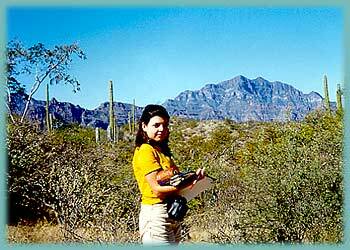 Luz Gonzalez de Bashan taking notes of distribution of giant cardons deep in Baja California desert. 1995-1999 - "University of Oldenburg, Germany." Project: Methanogenesis in mangrove soils. 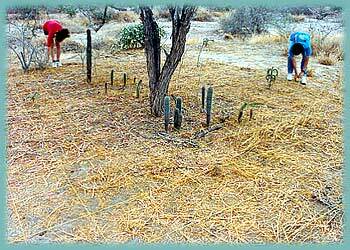 Patricia Vazquez and Neta Bashan prepare a grid around cactus seedlings growing under the mesquite tree. 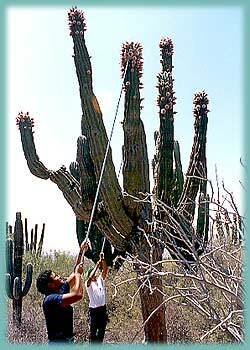 Angel Carrillo and Gerardo Toledo collecting cardon cactus fruits for extraction of seeds. 1997-1998 - "National Science Foundation of Colombia" (COLCIENCIAS). Project: Purification of agroindustrial water by bacteria and microalgae. Our People, Our students, Our History, Productivity, In memoriam.